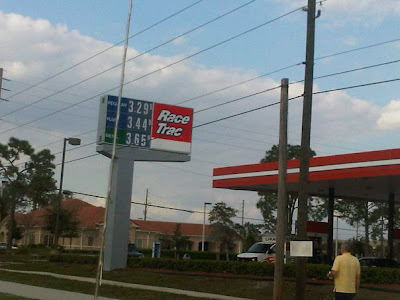 In less than a week, gas prices went up for 20 cents. The day before, I told my husband to have a full tank because there is a big possibility that gas prices will go up soon. Alas! Less than 24 hours, it goes up 6 cents. Good for us since we really did have a full tank at 3.17. The unrest and political turmoil in Libya and other countries in the middle east could be one of the reasons why the gas prices went up so high. According to the news, the possibility of having a $5 gas price are expected too. But, my husband said that Americans won't buy that idea. If the people will limit on buying gas, there will be a surplus of the product. If that happens, they will definitely drop the price! I will tract the gas prices this week. If it goes up, I guess it's high time to push the Republican Slogan.... "Drill Baby Drill".